Bike 1 – Back to Basics: this class covers bicycling basics and shows participants how to improve their bike control skills for travel or recreation. 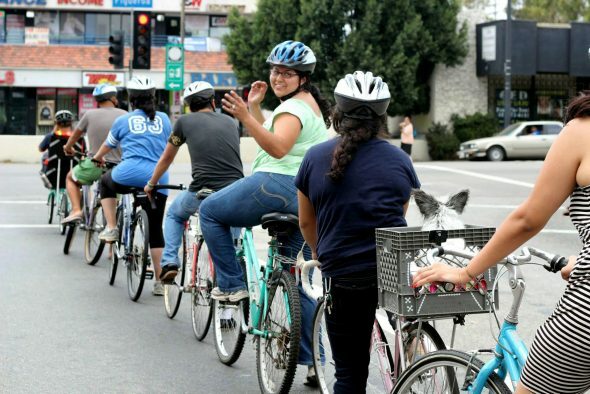 This is not a Learn to Ride class — participants should already know how to ride a bicycle. Bike 2 – Rules of the Road: this class will help participants understand the rules of the road and transform their knowledge of how to ride a bike into practical skills to navigate city streets and use their bikes for everyday travel. Bike 3 – Street Skills: this class will apply practical skills and critical thinking in a real-world setting, allowing riders to build on skills learned in the Bike 1 and Bike 2 classes. Bike 4 – Flat Tire Clinic: learn and get hands-on experience on how to maintain your bike and fix a flat tire at a Metro Bike Hub. Once you’ve brushed up on your bike skills, go for a spin on a community ride or at an Open Streets event! Both are great ways to experience bicycling in a safe environment. Upcoming classes, group rides and Open Streets events are listed below. Please take this short screening quiz to determine which class is best suited for your skill level. More classes and events will be added to the calendar throughout the year so be sure to check back if you can’t make any of these classes. It’s a pity Y’all don’t offer Learn to Ride classes. I really want to learn once I get in the weight range. Maybe that can change? Or is that what Bicycling 101 is? Teach the bicyclist that they must follow the rules of the road. Make sure they realize they shouldn’t ride against traffic. Bicyclists should ride in the same direction as the flow of traffic.